As I’ve been writing these pieces about the less obviously seen quarters of my home town, I’ve been aware that there is a danger of casting all in a glow of antique glamour. It’s true that these days Much Wenlock is a very attractive place to visit. For a small town, the range of architecture (representing as it does a thousand years of continuous human habitation), is fascinating. There are grand medieval mansions, and small stone cottages, and many quirky vernacular details. The magnificent timbered Guild Hall glimpsed below, and dating from 1540, is still the town’s council chamber, and with seats that feel like the rock of ages to those of us who have sat through many a council meeting. But this is all very well. For centuries, life for the labouring people of Wenlock must have been pretty grim, and one of the grimmest places to work must surely have been in the town’s many quarries, known locally as ‘the Rocks’, which I think says it all. I’ve explained elsewhere how the town sits beneath the twenty-mile limestone scarp of Wenlock Edge, an up-thrust fossilised, tropical seabed. I’ve written, too, of how the limestone has been exploited for centuries, and at least since Roman times. Milburga’s Saxon monastery, parts of which survive beneath the parish church, was built of local stone, as was the grand Norman priory that superseded it. Later, after the Dissolution, much of the stone was re-purposed in many of the town’s buildings, and often used to clad earlier timber-framed buildings. So it is that many of the town’s oldest surviving dwellings, including a medieval hall or two, are quite hidden from view behind much later stone facades. Other key uses for the quarried limestone were as a flux in the growing iron industry (i.e. 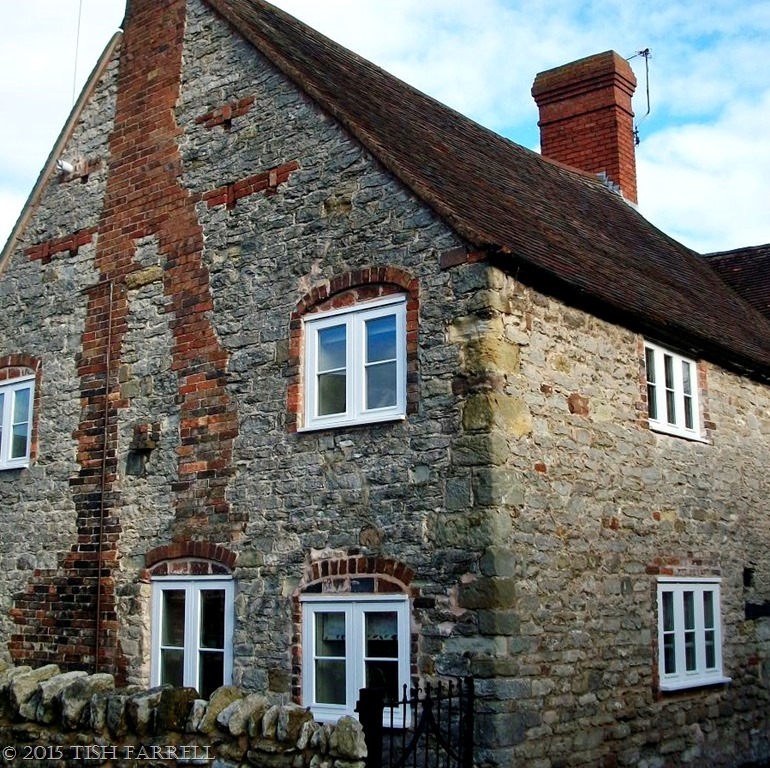 from at least the late 17th century) and for lime burning to make fertiliser and building mortar. For centuries quarrying would have been a manual task with heavy hammers, rammer bars, stone rakes and barrows as the quarrymen’s main tools. The use of black powder explosives, and then gelignite for blasting, was a much more recent practice, and not without its own serious hazards. Lime-burners also had their kilns near the quarries, but operations were seasonal, and lime-burners did not appear to make much of a living despite the demand for their products. 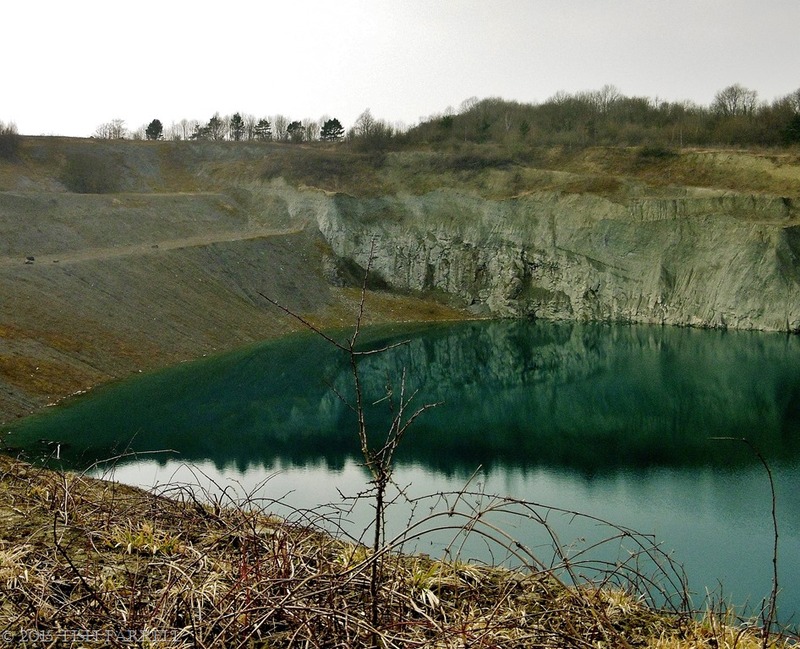 The quarry featured in this post is Shadwell or Shady Well Quarry. 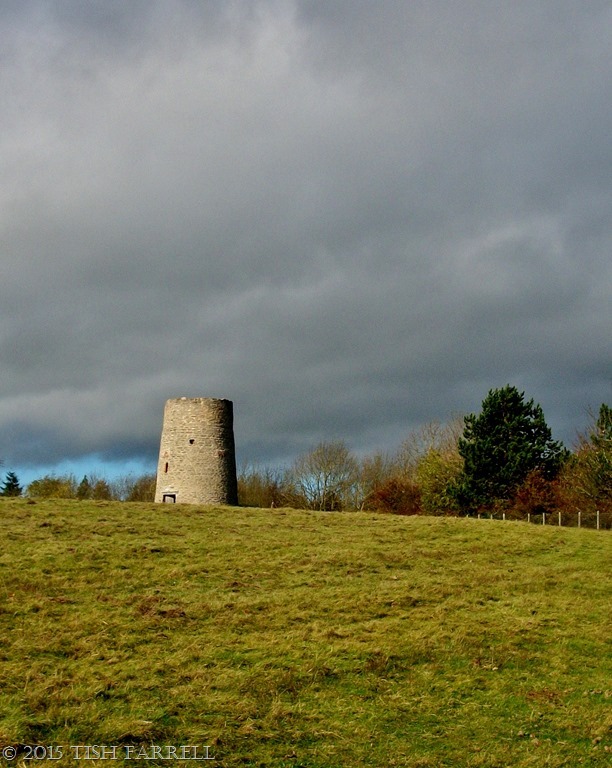 It lies directly behind Windmill Hill, and is the nearest one to our house. Workings here seem to have begun only in 1849 when Francis and John Yates of Ironbridge took a 14-year lease of a new quarry in Windmill Hill field, later called Shadwell Rock. They expected to dig 9,000 tons a year ( Glyn Williams Much Wenlock’s Limestone Quarries). In the 1860s the arrival of the railway plus the provision of a dedicated siding, saw Shadwell develop into an industrial operation. The South Wales & Cannock Chase Coal & Coke Company took over the lease, and in 1873 despatched 22,500 tons of iron fluxing stone to the Black Country in England’s industrial Midlands. The quarry continued to be worked until 1996. Since then it has been left amid growing desolation. A few years ago there were plans to open a diving school with fifty cabins in the woods below the windmiill, but nothing came of it. The water has a strange blue-green hue which makes me think of Andrei Tarkovsky’s film Solaris. The pool is said to be over 70 feet deep and, from time to time, daft young men who have had too much cider, film themselves diving off one of the cliffs. There have been a few near misses survival-wise. But at least some life forms have been making good use of the cliff faces. Since the blasting stopped peregrine falcons have begun to nest here. The same is apparently true for the other abandoned quarries along the Edge. There are ravens there too, although not yet at Shadwell. Perhaps they will come. It’s a pleasing thought: a case of positive re-purposing. Sun setting over Wenlock Edge: Or did the earth move? Pauline at Memories Are Made of This nominated me to take up this challenge. The idea is to “post a photo each day for five consecutive days and attach a story to the photo. It can be fiction or non-fiction, a poem or a short paragraph, and each day nominate another blogger for the challenge”. So today I would like to nominate Hanne T Fisker. She takes stunning photographs. Her blog is called Simplicity of Being, but her compositions brim with textural drama, and the light-and-shade complexities of the natural world. 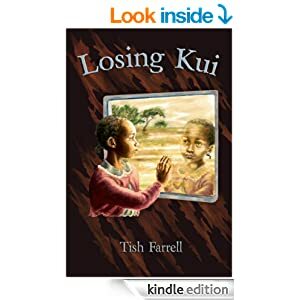 Please take a look at her work. 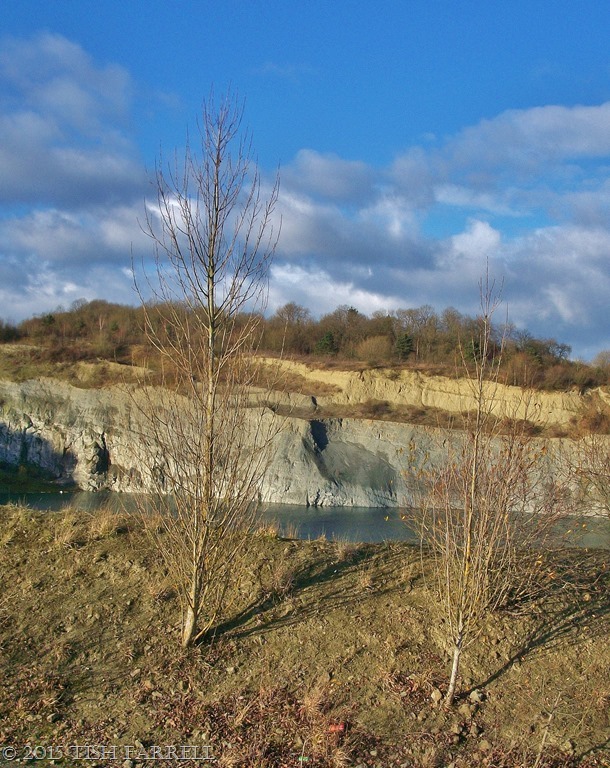 Posted on May 20, 2015 May 21, 2015 by Tish Farrell	This entry was posted in Environment, history, Photo Challenge and tagged 5 Photos 5 Stories, limestone, Much Wenlock, Shadwell Quarry, Tish Farrell Writer, Wenlock Edge. Bookmark the permalink. The colours have been so beautifully muted. Beautiful pictures. The colours in the first quarry pic are lovely, aren’t they. I took it on a freezing winter’s day when the light was just right. Nearly got blown away though. Thank you much for nominating me for this challenge, Tish! Great post, very historical too. They would have been hard times to live and work. This is an interesting post. There is a Shadwell Quarry near here too. They mine peridot and olivine tere. I like the sound of a peridot mine. Our Shadwell is a bit grim, and worse still when it was being worked. Lots of fossil shells there though. I forgot to mention those. You can go fossicking there in the summer. I haven’t been yet but it would be amazing to find a scrap of peridot the miners had overlooked. 14 year lease? What an odd figure. Is the water in the quarries simply from rain? Are there any fish in the ‘lake’. Have you seen the falcon yet? That would be a sight to remember. Can’t explain the lease length, Arkm and that’s a good question about the water in the quarry. Whisper has it that the quarry people broke into the aquifer. We get our water from springs, where the water has drained down Wenlock Edge and into the bowl where the town sits. I’ve not been close enough to know if there are fish, though I spotted a duck down there. It’s private land really. The water looks rather dead somehow, and nothing much grows on the gravel banks even after 20 years. As to the falcon, one whipped past our heads when we were walking along the old railway line nearby. At the time we both said ‘what the devil was that?’, and only found out later about the falcons. So it was a half-sighting really. But I did see a red kite the other day on the other side of town. They’re making a come-back and moving up Corvedale. Also we have lots of honey buzzards, though it’s odd to see them wheeling over the town. I have just realised something. I have been getting Much Wenlock 5 photo thingies in my mail and it has just dawned on me they are all separate posts! Let me grab a coffee and go and read the ones I’ve missed. What a divvy. Oh those wonderful horizontals in that first photo., and that orchid-guarding windmill again. And peregrine falcons and ravens. And sympathetically told history. 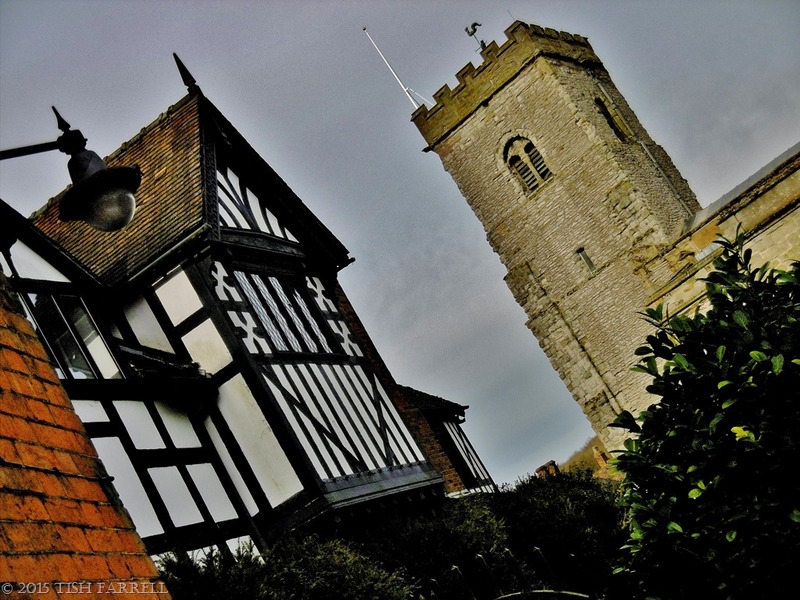 Much Wenlock is obviously a town worth visiting: thank you for being a wonderful virtual guide. You’ve reminded me to go orchid spotting. The weather has picked up now so I’d better get out there asap. Of course that wasn’t my intention. Purely Freudian! I guess it was supposed to be one photo, but then I followed Pauline’s lead, and she was using quite a few. Oh well. I’m just reading Pauline’s and she’s set you a bad example 🙂 Well… a good one really 🙂 Who needs rules anyway? Thank you so much for this third lesson tonight. My the stories that time has to tell! It’s good to know that the falcons are making a comeback. I always find old quarries rather eerie; disturbing or disturbed; ghostly. Me too re old quarries, so it’s good to know they are just the thing for formerly threatened species. Last year we were also intrigued to find peregrines nesting atop Lincoln Cathedral. It was amazing to be in the middle of a city and hear them calling, and to glimpse them so high up. That is intriguing. A peregrine falcon can be translated as a “pilgrim” falcon; they certainly seem to be pilgrims in their choice of habitat. I love that – pilgrim falcons. Thank you for this image. Abandoned quarries are quite spooky. It would be nice to do something with a place like this, turn it into a nature park with cycle tracks and footpaths where people could come and picnic. At the moment this place looks quite dead. Lovely colour of the water in your last image. That would indeed be lovely, Jude. We had been hoping for something similar and on a bigger scale for the other quarries. The National Trust had great plans, but were gazumped. Ten out of ten, again. Very interesting…would love to see some fossil shells in that old quarry. Happy that the falcons are nesting there now. I feel as if I know Wenlock Edge for real – beautifully depicted, Tish!